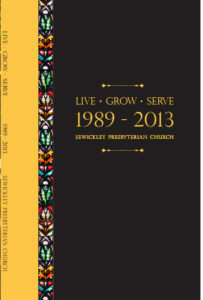 For a copy of our newest 25 year history book Live, Grow, Serve 1989 – 2013, please contact Jennifer Johnson at 412.741.4550 or jjohnson@sewickleypresby.org. Earliest Presbyterianism in the Valley, an address by the Rev. Matthew B. Riddle D.D. LL.D. The Pastorate of Dr. Campbell, an address by Rev. William O. Campbell D.D. “For the interests of Christian unity, it seems rather an invidious distinction to attempt to separate the work of women from that of men in an organization where all have labored together in harmony to advance the one great cause of Christ and His Kingdom. Nevertheless, the women of this church have had an individual place and a work of their own and they have “builded the walls over against their own houses” as faithfully as have the elders and trustees with whom they have cooperated. “My words today can be only a recapitulation of some things known more or less familiarly to you all and certainly well-known to some of you. We are met here by the courtesy of Miss Quay, not to repeat but to commemorate what was done here 100 years ago. We represent all who, present or absent , living or dead, have been called into the fellowship and service of the Sewickley Presbyterian Church during these years. We would praise God for them with such a simple ceremonial as we imagine they must have used who constituted that first little group of February 19th, 1838. “We began as a church of the Old School – that is to say, of theological conservation; but we never have been a church of doctrinal controversy. Our ministers here have done their work on a plane above all such strife; and today as always the doors stand open to liberal and to conservative alike. But within, their disputings have no place. The circumstances have been such that the church has not become institutionalized. From earliest years it has maintained its Sunday School and its Missionary Society. But its larger work in the community has been done in accommodation to and not in competition with the activities of the Union Aid Society and of the Young Men’s Christian Association. If it concerns anyone to gain some measure of the extent to which this church permeates with its influence the life of the community, let him consider these organizations and inquire who effected them; let him list for himself the officers of all the altruistic organizations and note how many are Presbyterian. . . .
“In discussing recent historical writing at one of his book reviews, Dr. Amerman made the point that one characteristic is the use of “adiaphora” – a theological term for matters which are of interest but not necessary to faith. Applied to history “adiaphora” are details of no great importance, which serve, however, to bring alive the period or the person under discussion. “In the 1963 History, Mrs. Mary Cooper Robb classified the women of the congregation and their work as the Church’s “Fourth Estate.” They were expected to work, and work hard at manifold tasks, but they were not permitted to be either elders, deacons, or trustees of the Church; consequently, they could not represent our Church in such general bodies as the Presbytery, Synod and General Assembly. Except for their right to vote in congregational meetings, they were kept apart from the administration and direction of our Church and its religious affairs. “Other Presbyterian bodies, however, had gradually seen the light. In 1915, the Constitution of the Presbyterian Church had been amended to authorize the election of deaconesses. In 1930, it was further amended to authorize women to be ordained as ruling elders, and as elders, they became eligible to serve as representatives in the Presbytery, Synod and General Assembly. In 1956, the General Assembly authorized women to be ordained as ministers in the Presbyterian Church. This book differs from its predecessors in that it covers only the last twenty-five years of our church history, has numerous color photographs, and is available is electronically. In recounting the activities of the church during this period, the author’s main sources were Session Minutes and the Annual Reports that contain articles written by pastors and church members in their roles as committee chairs. In addition, there are commentaries by long-standing church members, as well as an interview of our Director of Music Ministries, who served us for all those 25 years. “As a child, I was taught about our Lord at Sunday School. I was confirmed in 1943 at age 13. Staying in Pittsburgh throughout my career, and never moving from Sewickley, I served as a Trustee and then as a Session member on and off over the years starting back in 1957.” Reflections of a Church Leader. “So come to him, our living Stone – rejected by men but chosen and precious in the sight of God.